Usually one says the phrase “piece of cake” when referring to an activity that requires little effort to finish or a job that’s simple. It is true that some parts of each of these recipes were a piece of cake but the easiest part of all of was eating them! 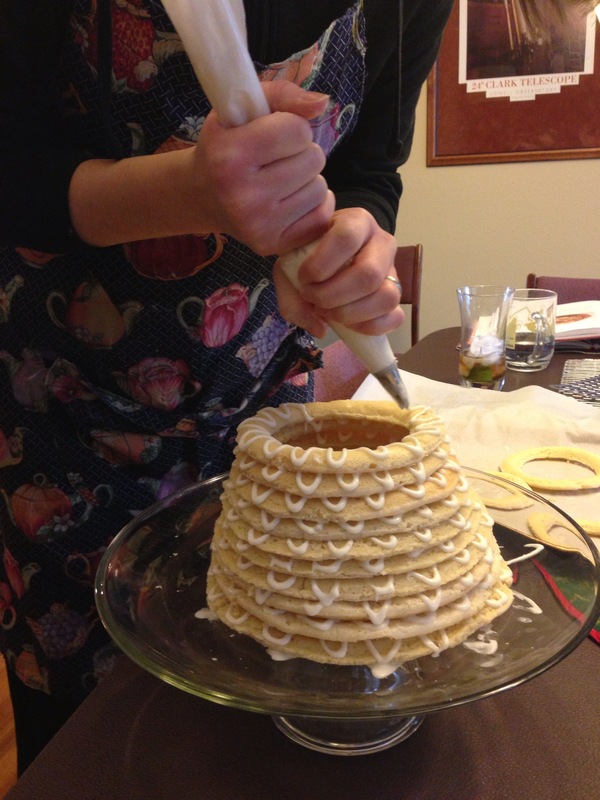 The first, a Kransekake, was a cake Megan and have been wanting to make for Christmas Eve and this year we finally did. 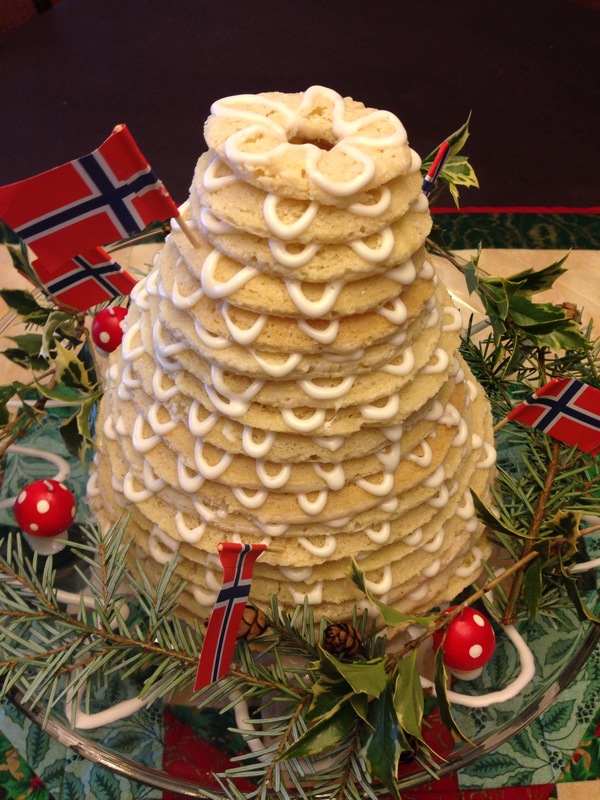 Kransekake is a traditional Norwegian Wedding Cake which if you’ve grown up in a family with Scandinavian heritage you are probably familiar with. 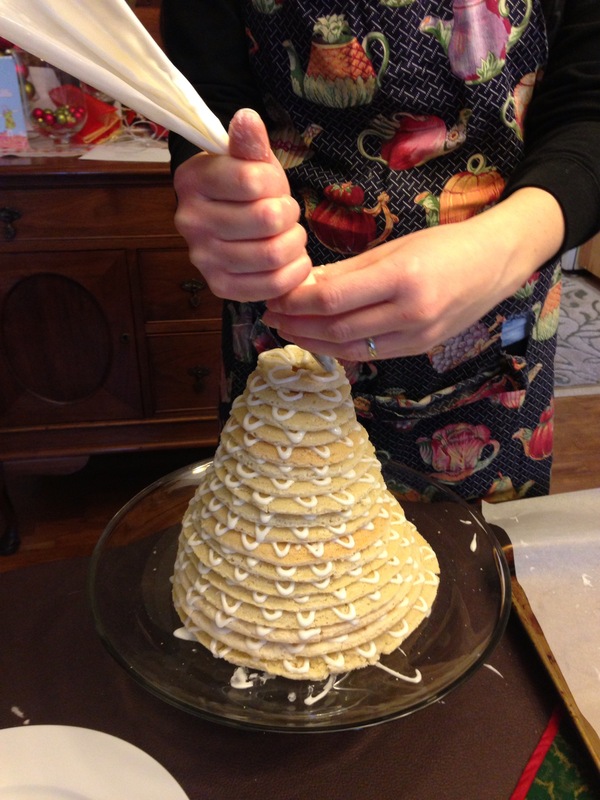 Kransekake is also served at the holidays because of its tree shape. 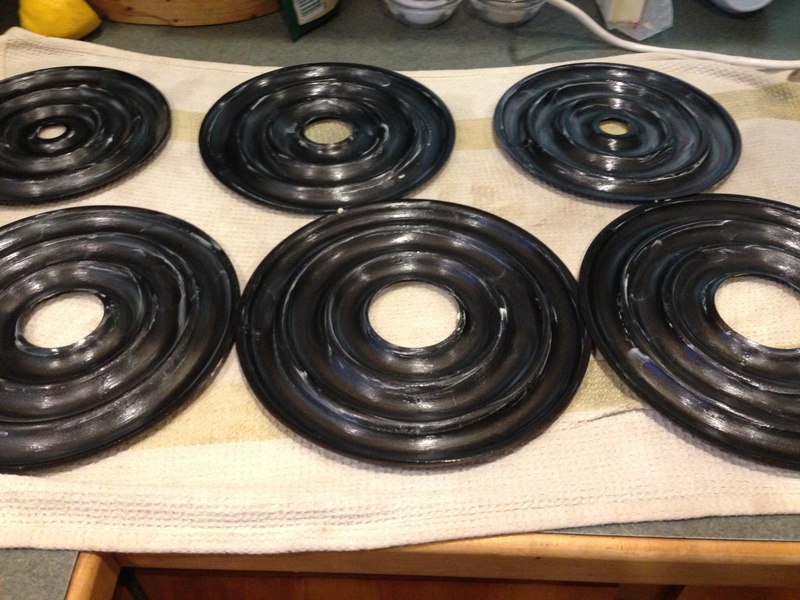 It can be made with as many rings as you like, our set of molds consisted of 18 graduated rings. 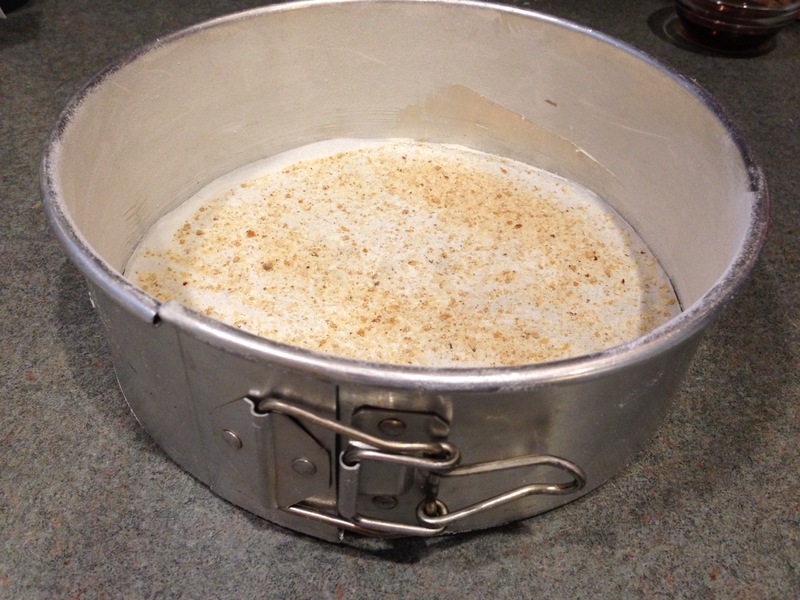 The dough consists of almond paste (ground up blanched almonds), egg whites and powdered sugar. 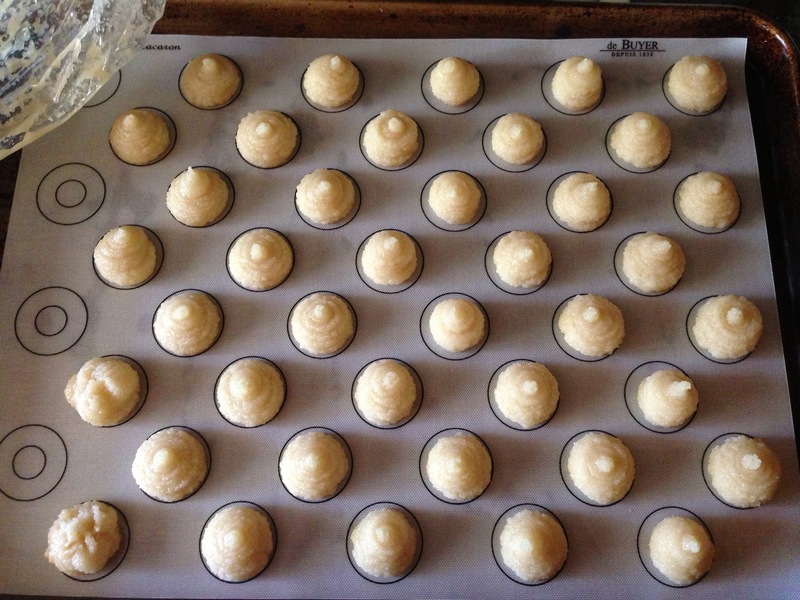 The dough is then piped into the molds so they are smooth. After the dough is baked and cooled they are assembled into a tower that is held together with icing and then decorated with flags and candies. Nothing about the recipe itself is difficult but the assembly requires patience and steady hands. The cooked dough is very fragile and has a tendency to crack, however, it is just moist enough that it can be smashed back together and with the icing glue, no one ever knows. It had good flavor and was a fun decoration as well as homage to part of our heritage but since we’d had the Feast of the Seven Fishes for dinner, no one was very hungry for dessert. 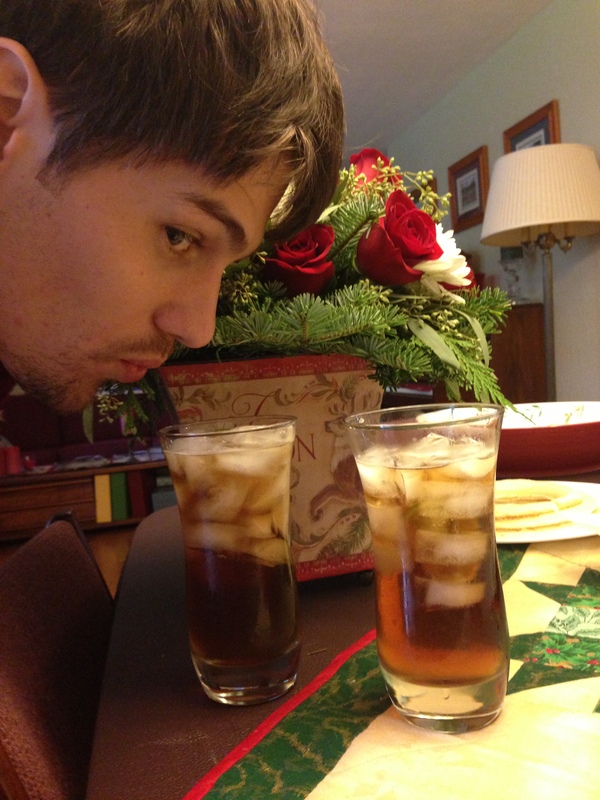 Dark and Stormies were the perfect addition to our afternoon of baking! Dough is not a perfect medium. 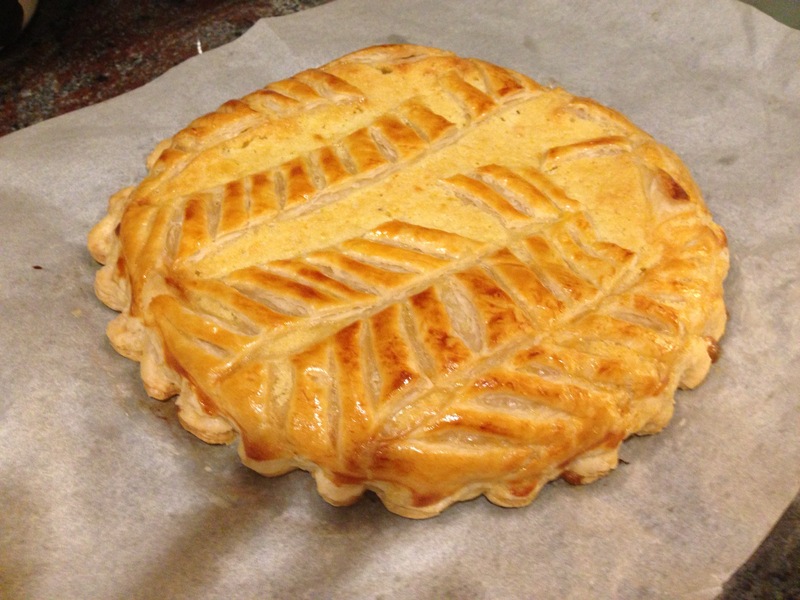 After the holidays I decided to make a Galette des rois or King’s Cake for a family dinner which was somewhat close to the Epiphany when this cake is traditionally served. I was inspired by a David Lebovitz post on the topic . 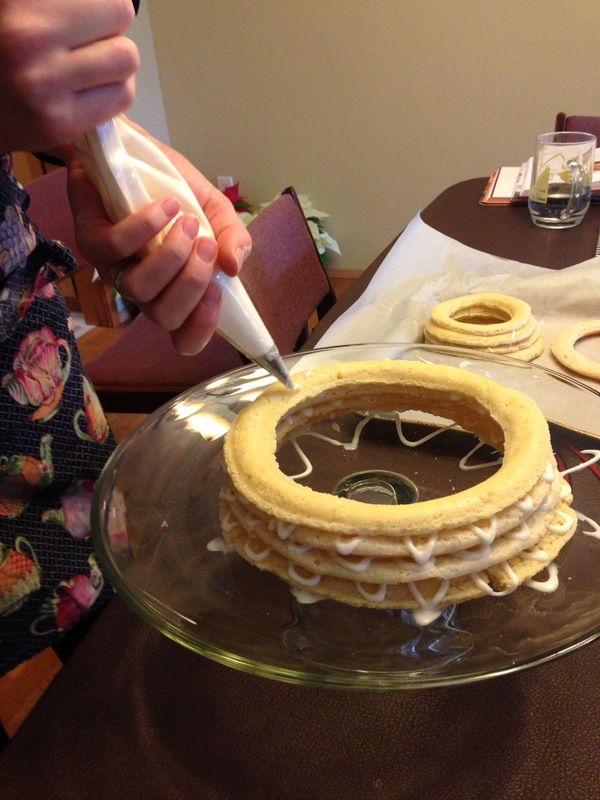 Oddly, it was similar to the Kransekake in that it was a light, almond flavored cake. I used pre-made puff pastry making the whole affair quite easy. My puff pastry was quite frozen and I made the mistake of defrosting it in the microwave. 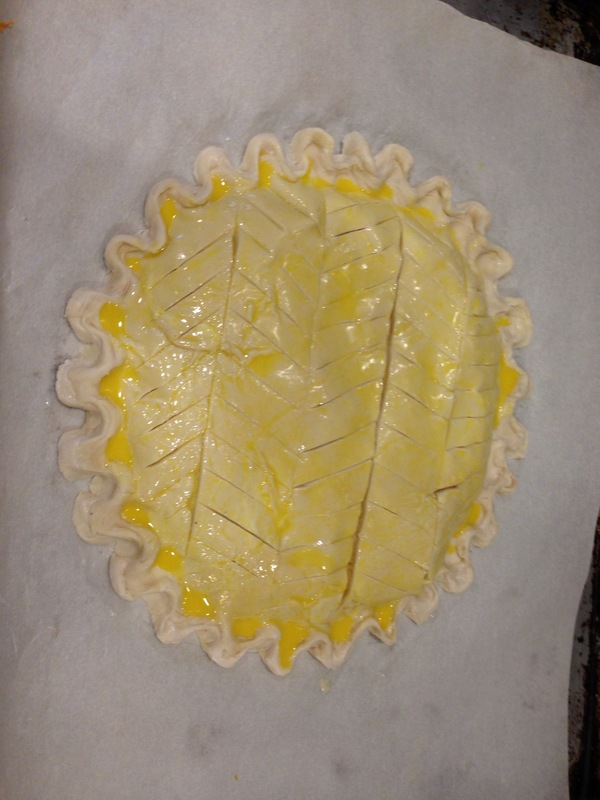 Luckily the buttery pastry was forgiving and I was able to salvage it. 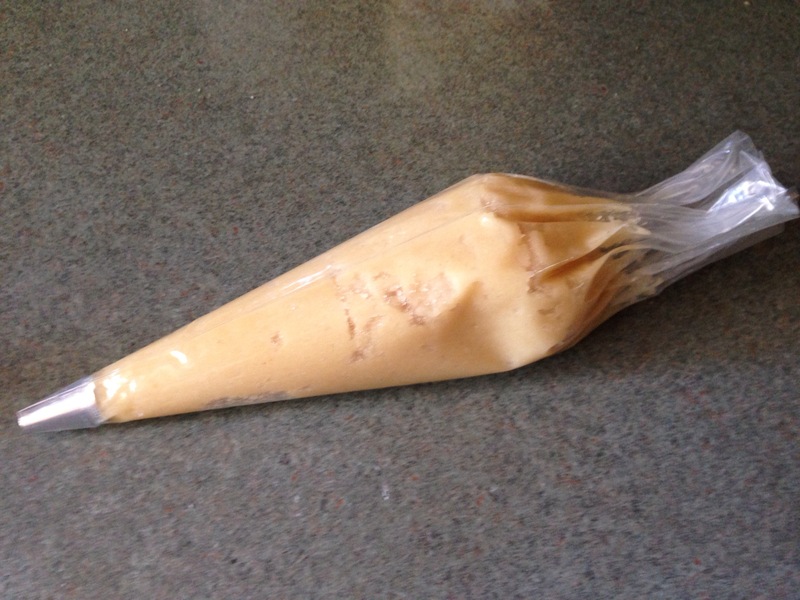 If you make this, do be sure to spring for the quality puff pasty–the first ingredient should be butter and this will set you back a few pennies–approximately three times as much as the brand the grocery store usually carries–you’ll have to go to a Metropolitan Market/Whole Foods/Tacoma Boys type store to find it. 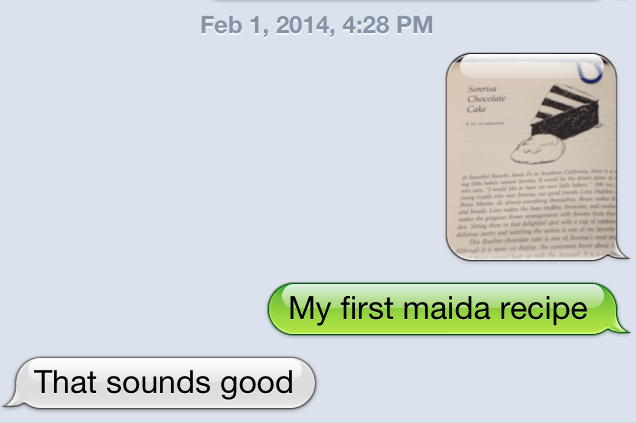 While we were in Portland over the holidays, Megan found a Maida Heatter cookie book at Powell’s Bookstore. She made one of the cookie recipes on New Year’s Eve and they were fantastic! 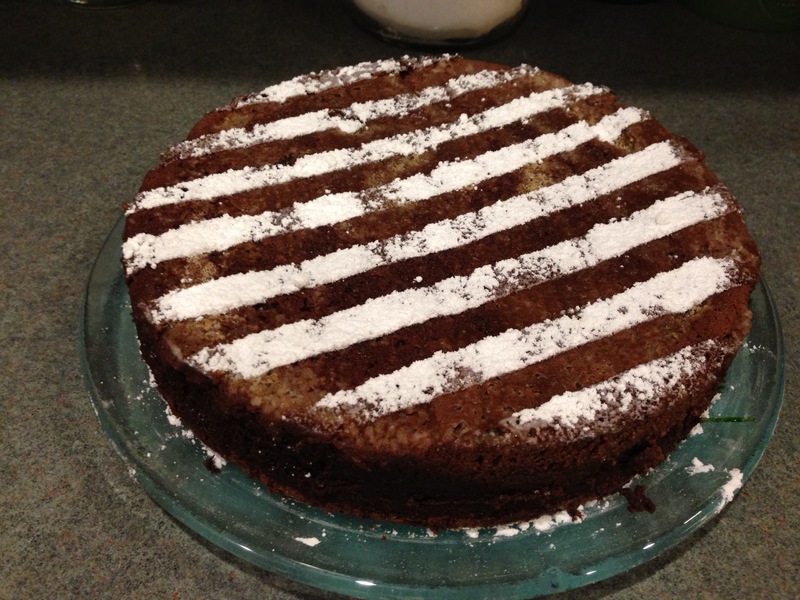 I found a copy of Best Dessert Book Ever at King’s Book in the Proctor District and yesterday I made Sonrisa Chocolate Cake which is her interpretation of a cake made at the Sonrisa Bakery in Santa Fe, NM. This recipe requires very few ingredients but is a bit fussy to assemble and bake. That being said, it’s worth the fussiness. It has the texture of cheesecake without that richness that always seems a bit too much and without the distraction of the crust. 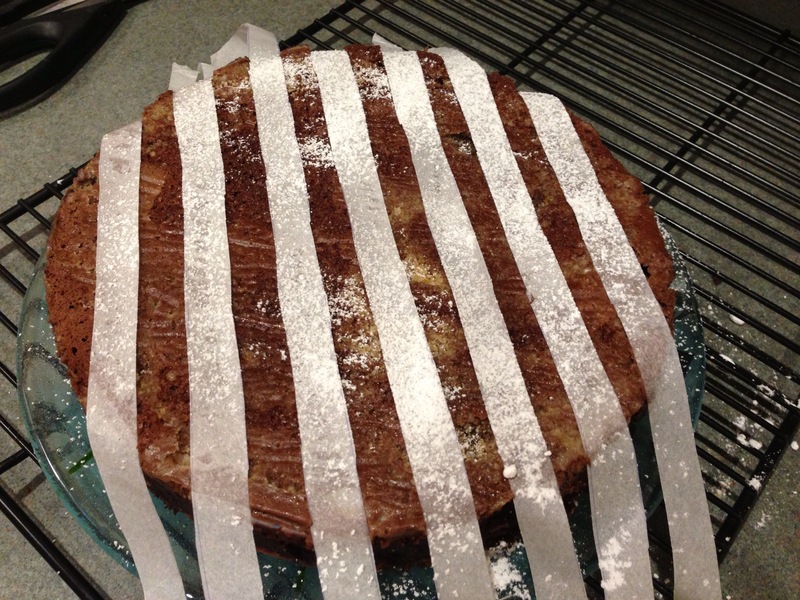 I went ahead and did the 1/2 inch strips of paper on the top to create the powder sugar design but you could easily skip that part and just sprinkle the top all over, but be sure to sprinkle more than you think as the sugar melts into the cake. If you don’t have a double boiler do what I do and use two saucepans. Just do not get water in your chocolate! Two mixers are handy for this recipe. I used my hand mixer for the egg whites. Preheat oven to 375 degrees and place oven rack one third up from the bottom. Butter an 8-by-3-inch springform pan. Line the bottom of the pan with a round of parchment. Butter the parchment and then dust the entire pan with flour. Sprinkle fine bread crumbs on the bottom of the pan. The cake is baked in a water bath, so wrap the pan in two layers of aluminum foil–don’t let the foil go over the top of the springform and make sure you wrap it so it is watertight. 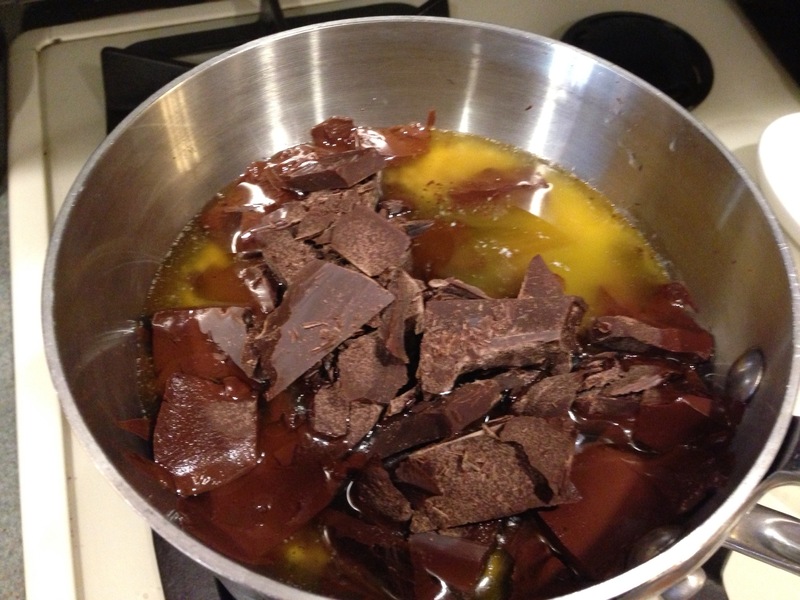 Cut the butter and chocolate into small pieces and place in the top of a double boiler over warm water on moderate heat and let cook until partially melted. Then stir until completely melted and smooth. Remove the top and set aside. 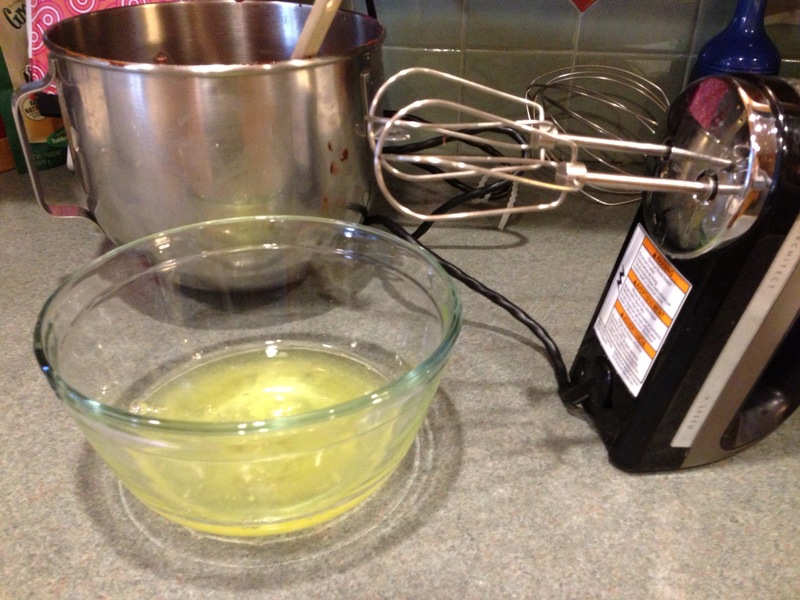 In the bowl of an electric mixer, beat the egg yolks with 3/4 cup of the sugar on high speed for several minutes until the mixture forms a wide ribbon when the beaters are raised. 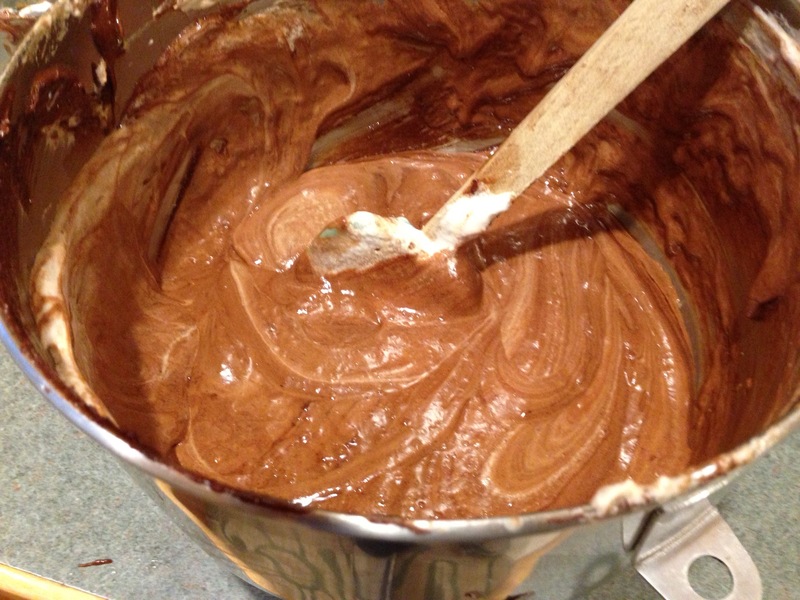 On low speed add the chocolate mixture and the rum and beat, scraping the bowl with a spatula until smooth. Set aside. If you do not have another mixing bowl, or a hand held mixer, wash your mixing bowl and beater and dry well. In a clean small bowl with clean beaters (so important with egg whites), beat the egg whites until they hold a soft shape. On moderate speed gradually add the remaining 1/4 cup of sugar, and then, on high speed, beat until the whites just hold a straight shape when the beaters are raised. Do not beat any more than necessary. Stir one fourth of the whites into the chocolate mixture. 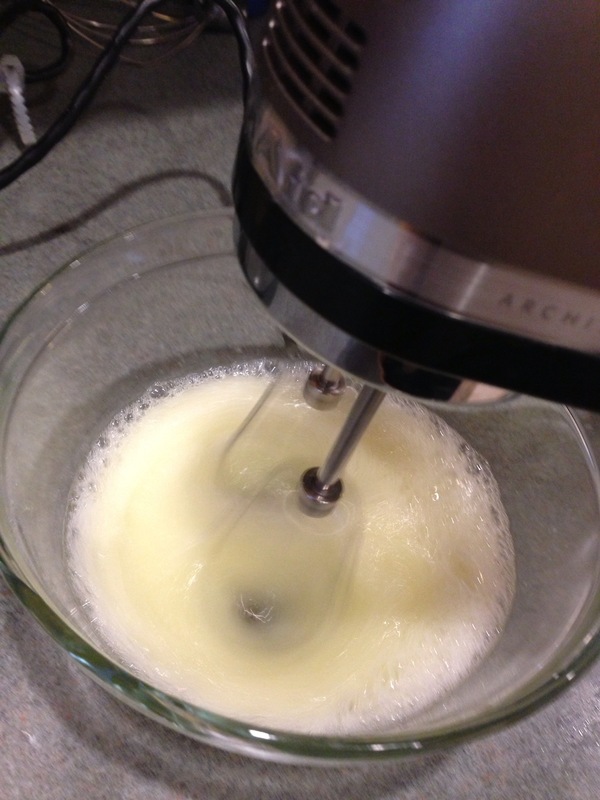 Then, in two additions, fold in the remaining whites only until just barely blended. Transfer the batter to the prepared pan. Place the pan in another pan that is wider but not deeper. Place in the oven and pour hot water (the water from your double boiler works perfectly) 1 inch deep into the wider pan. Baker for 15 minutes. Reduce the temp to 350 degrees and bake for 15 minutes more. Reduce the temp to 275 degrees and bake for 30 minutes more. 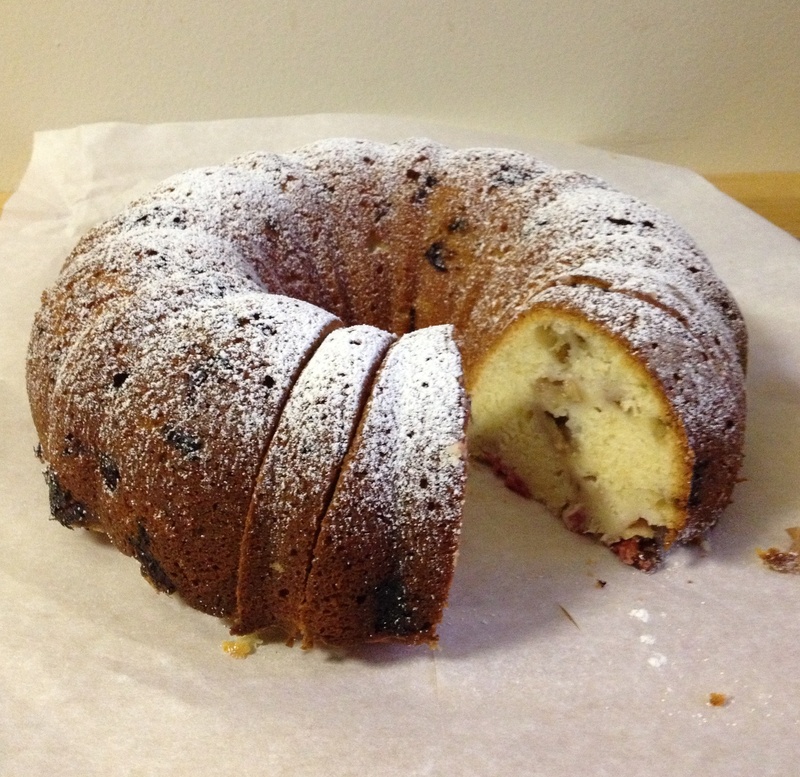 Turn off the oven and prop the door open a few inches and let cake sit for 30 minutes. Remove the cake from the oven and the water bath. 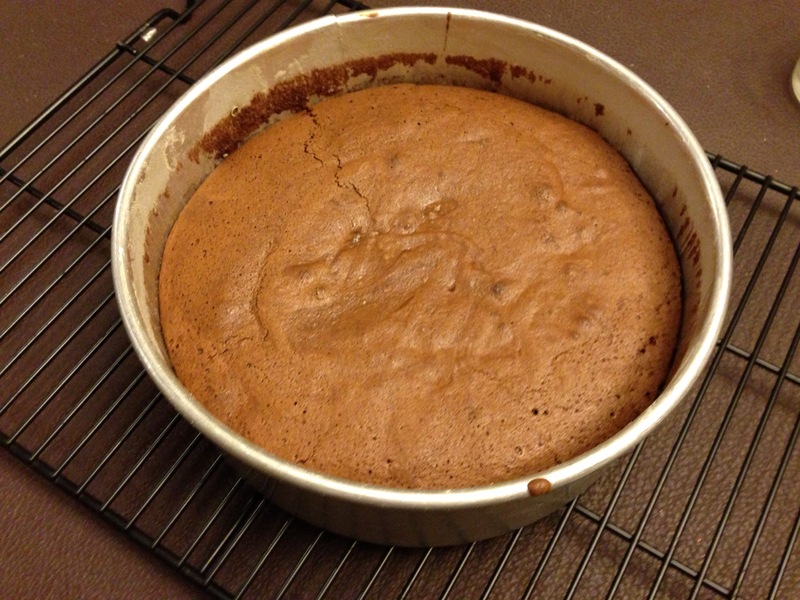 Remove the foil and let cake stand for several hours at room temp until completely cool. Run a sharp knife around the edge of the springform pan and then remove the sides of the pan. With a table knife or metal spatula quickly smooth the edges of the cake. Then cover the cake with a cake plate (or the plate you will serve it on) and turn the cake (and the plate) over. Carefully remove the bottom of the pan and slowly peel of the parchment paper lining. Leave the cake upside down. Optional (in my opinion). Make 9 inch by 1/2 inch strips of wax paper. Lay across the top and then sprinkle generously with powdered sugar. Serve at room temperature with a mound of whipped cream on the side (1 cup whipping cream, 1/2 teaspoon vanilla and 2 tablespoons powdered sugar). Spring has finally arrived here in the Boston area! 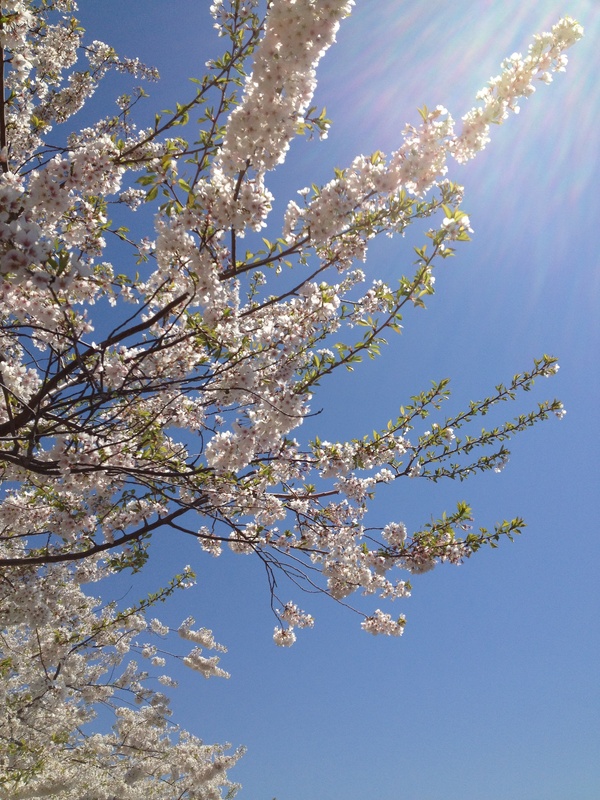 It was a cold and snowy winter, but the sunshine, warmth, blossoms, and leaves have finally arrived. 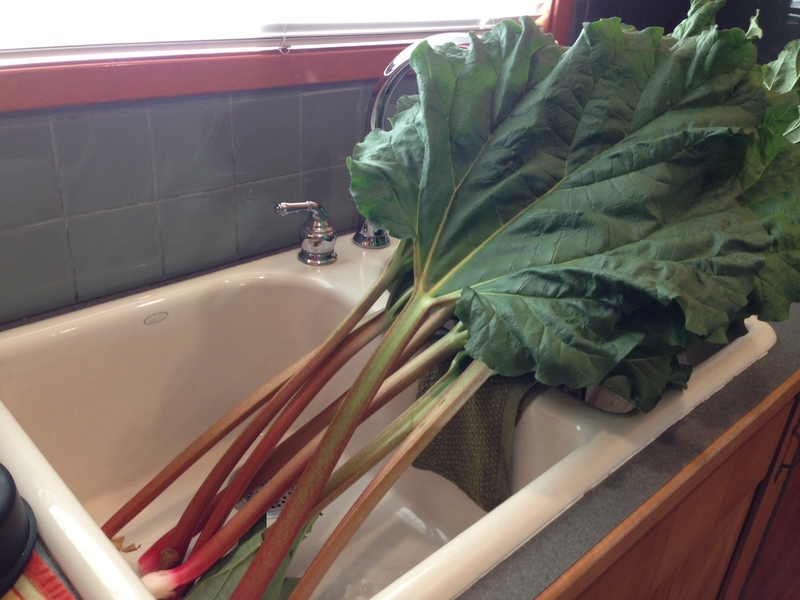 So has the rhubarb. Here in Cambridge, I’ve had my eyes open for rhubarb at the various grocery stores, but have been disappointed by either its absence or its pallor. I’ve also been disappointed by the fact that I have to buy it at all, since last spring I could just have my mom cut me a pound…or ten (check out the photo below). Such is the price of city living. However, I was able to find some lovely, vibrantly-hued rhubarb at Market Basket this past weekend. My next task was to figure out what to make. 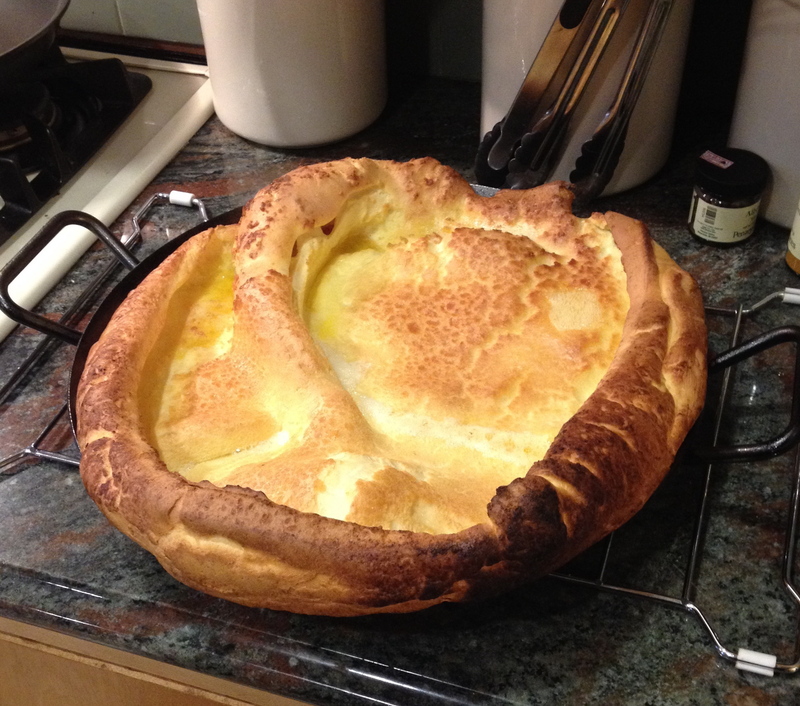 This was a challenge not for a lack of recipes, but precisely because there are so many good ones out there! 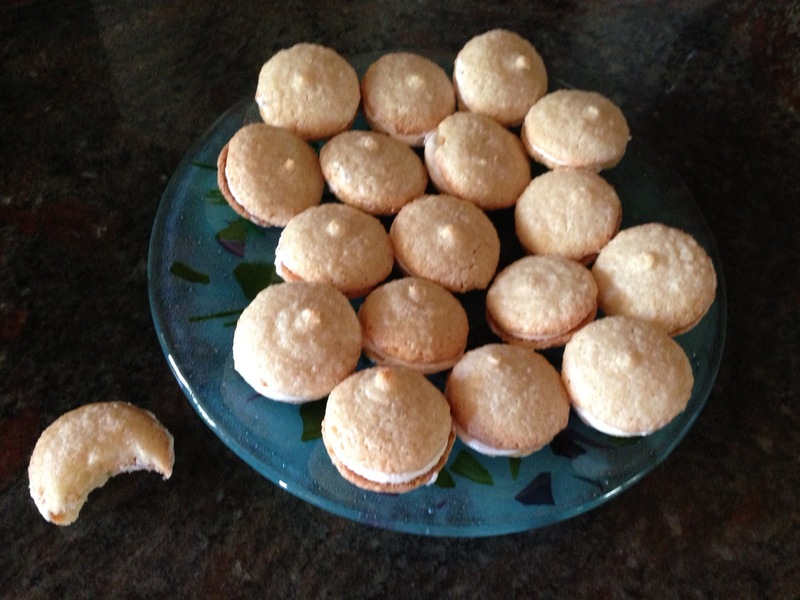 I spent an hour (or so…) googling through recipes. Instead of replicating this search each spring season, I thought I’d take the time to organize and post them here. 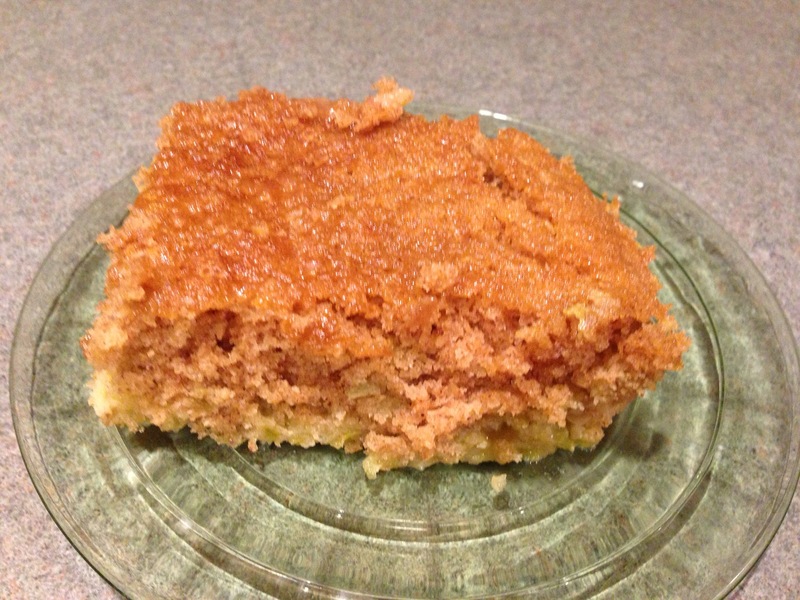 rhubarb upside down cake – made this several times, it is a great way to show off really red stalks. lemon buttermilk rhubarb bundt cake – made this several times, it has a pleasantly tart flavor from the lemon, and I like it more with just powdered sugar instead of with a glaze. This is what I ended up making, by the way! It is an easy one to bring into work. rhubarb pie with orange zest — this is my favorite pie ever. 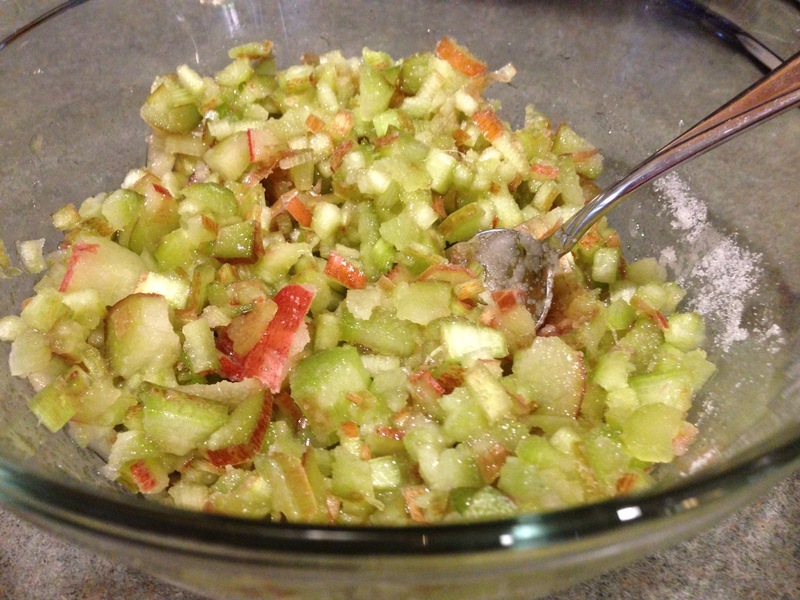 rhubarb syrup with rosewater – it turns out I’m not the biggest rosewater fan. If you like it, you should make this, or just use a tiny amount. vanilla-roasted rhubarb and strawberries – Stephanie made this and said it was delicious, but I didn’t get to try it — this will probably be my next attempt! rhubarb and raspberry crostata – Steph made this, I did get to try it, and will thusly vouch for its deliciousness. 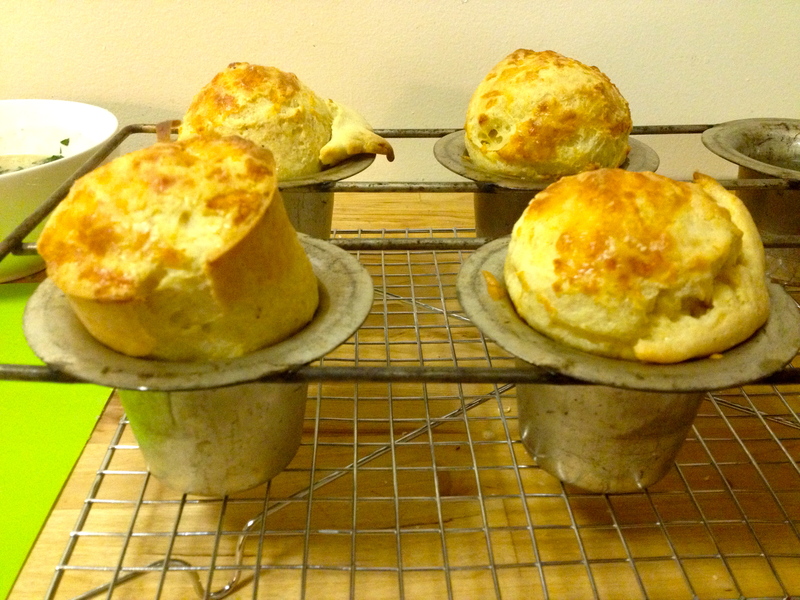 rustic rhubarb tarts with corn flour – Deb Perelman’s tweaks to Kim Boyce’s recipe from (the amazing) Good to the Grain. The tender dough breaks apart very easily — make sure to have plenty of all-purpose flour on the counter and your hands. 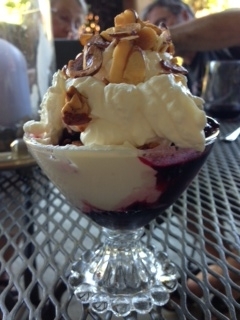 Now that I’ve tried the compote with a vanilla bean, I’d like to try the original version with hibiscus. rhubarb hamantaschen from Deb Perelman’s own amazing book, The Smitten Kitchen Cookbook (this isn’t the link to her blog here, though — and again, I haven’t tried this, but thought I’d link with that caveat and the plug that if you buy Deb’s cookbook, you won’t regret it! ).